Kassie and Peter of Guerilla Toss sent us these answers to our questions in this next installment of q and also a.
kassie: Probably Harald Grosskopf – Synthesist. I was listening to it while driving on this really dark, windy mountain road in the Catskills. It really worked with the moment. Harald Grosskopf was a drummer who lived in Berlin whose work is inspired by early Kraftwerk and long-form drone explorations by Schulze and Tangerine Dream. He played on a lot of great records like Ash Ra Tempel, Cosmic Jokers, Klaus Schulze and more. The song is airy, light and has a satisfying analog crunch. The whole album is really great, but the title track is special. 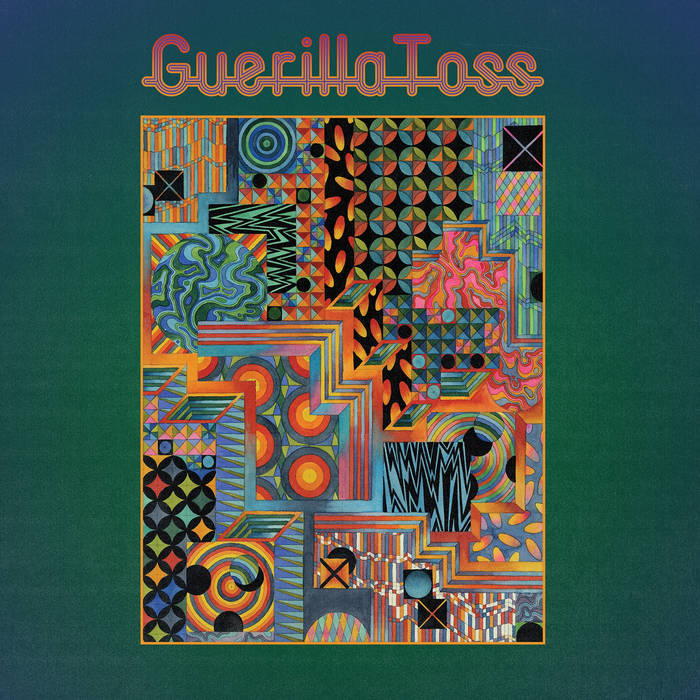 A lot of the music GTOSS has been writing recently is influenced by 70s and 80s German krautrock. Lots of repetitive, driving beats, soaring synthesizer and metallic guitar tones on this upcoming album. peter: I was driving to upstate NY last night from the city listening to some basic rock radio station. Gimme Shelter was playing as I arrived at my destination. q: What is the first album you remember purchasing? k: Probably a cassette tape of Britney Spears’ “Hit Me Baby One More Time”. Many vivid memories associated with this tape. I was painfully shy as a child. I pretty much had headphones on all the time with my little portable cassette player blaring. One day, I was jamming away, minding my own business on the bus, and the cutest, most popular guy in school tapped me on the shoulder. He saw the cassette case and asked to hear one of the lesser known, B-sides of the tape. It was probably “E-mail My Heart” or something. I froze. I remember my face turning beet red. I had no words. All I knew is that I had to “get” to the song somehow. Minutes seemed like hours as I meticulously rewinded and fast forwarded with my sweaty chubby fingers. After some time, I finally arrived at the requested song. I handed over the headphones. He listened to the song in full, all three minutes and forty-three seconds of it, bobbing his head to the beat. Then he handed the headphones back. We never spoke again. p: When I was in middle school my mom gifted to me a recently unearthed vinyl collection that had belonged to her and her sister. Lots of great punk/new wave stuff – Clash, Tom Tom Club, Slits, Raincoats and more basic 60’s rock and roll – Bob Dylan, The Band, The Who, Joni Mitchell. So I began collecting records at a young age, back when you could find most classic albums for less than a dollar from street vendors in NYC. Hard to say, but one of the first purchases I remember making was the Easy Rider Soundtrack because I liked the song “The Weight” by The Band (although the version on the soundtrack is a cover). What really stuck out to me was “If You Want to Be a Bird” by the Holy Modal Rounders. I remember thinking “This is weird – I like this”. k: The last album I remember purchasing is a Mark Cone album off Bandcamp! Written and performed solely by Jackie, Drummer of the band Sediment Club, the album was recorded on a miniature Casio keyboard and a meticulously programmed 8-bit drum machine. Mark Cone sings is everything you want from something you didn’t know you needed. We performed together with this project a few times in LA and it was so fun. p: Sun Ra Live At Montreux record from some dude on 6th Avenue. It’s good. q: What is your favorite memory of experiencing music in a live setting? k: My favorite memory of experiencing music in a live setting is when I was five years old and I saw my brother perform with his thrash band Only Living Witness. His stage dives and unwavering support really encouraged me to pursue music in a band setting and beyond. p: Parliament Funkadelic in 2005 at BAM. It was a relatively tame audience which was surprising. A lot of people were being lame, sitting and tapping their feet. I was with a crew of 6 or 7 friends, and this was back when smoking indoors was recently outlawed, but you could still easily get away with smoking weed. We were dancing and chain smoking weed the entire show and the band was AMAZING. They played for a few hours straight – no stopping between songs. George Clinton’s granddaughter came out and rapped a bunch. I don’t remember much of the show but the vibe and positivity of that night still has me buzzing. q: What are the best and worst things about being in a band in NYC circa 2018? k: The best thing about being a band in NYC is that we can play a show in Brooklyn and a lot of stoked people will come out and make us feel like we are really getting somewhere, and having a positive impact. Another great thing about being in NYC is that there is literally every type of person. There’s so much personality and uniqueness to write about and experience. It’s awesome. The worst thing about being in NYC is the cold, the garbage and lack of nature. q: What piece(s) of culture are you really really excited about right now (if any)? k: I am really excited about younger kids making music these days. My cousin Erik is 16 and he has so much technology at his fingertips. He is learning Abelton and has kind of encyclopedic knowledge of current and historic musicians. He probably has a bigger record collection than I do at this point. Kids remind me of that kind of unbridled excitement that happens when you discover something really new and interesting. It’s so important to remember to continue to find things that make you feel that way. q: What should we know about Twisted Crystal? k: Twisted Crystal is out Sept 14th and I think it is our best album yet. There are a lot of special songs on this album and we plan on performing a lot of them on this upcoming tour. We are doing a nationwide tour starting Sept 17th and ending in NYC at Market Hotel Oct 31st! p: It’s another GT record – it’s different. They’re always different because we are always inspired by new things. GT Ultra was maybe our take on modern pop and electronic music. Eraser Stargazer could be our take on funk and dance music. Twisted Crystal Is like a classic rock record. Many nods to Bowie, kraut rock, 70’s prog, with some Madonna and Grace Jones thrown in… lots of lead guitar. That sort of thing. Next we will make a harsh noise vapor wave record or something. Kassie’s lyrics as usual are deeply personal as well as political. There are some heavy messages if you listen closely. Overall the band is in a really good place right now and we are ready to absolutely shred this upcoming tour to pieces. We have about 50 songs in rotation for our live set – new stuff, old favorites, a few covers. I think we are sounding better than ever. GT is on tour this Fall!